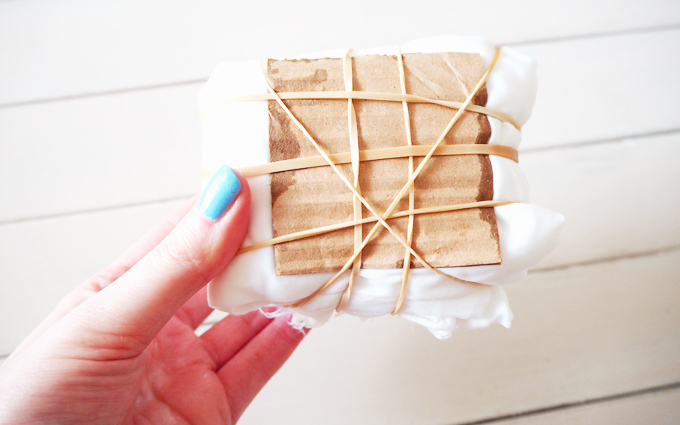 Last week I tried my hand at shibori dying for the first time! 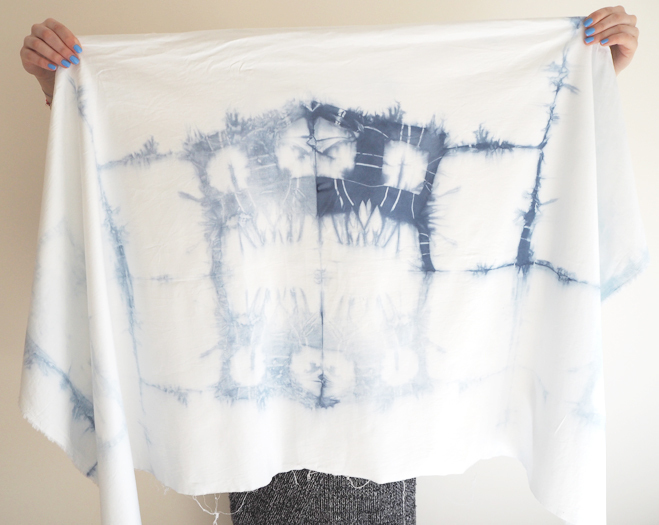 This is a really easy way to dye your own fabric and create unique patterns and prints at home. After signing up to become a We Make Collective member, I followed one of their easy step by step guides on Shibori dying to create this unique square, geometic design that I later made into a cushion. The technique I used was called Itajime but you can create any pattern you like using a variety of techniques, check out Honestly WTF for more info on different ways to dye fabric. I then sandwiched it in between two bits of cardboard and tied lots of elastic bands around it. This helps create the pattern and lines in your fabric once dye. I felt my cardboard squares were a little too small and not strong enough to resist the dye, so if I was doing it again I would cover the top with stronger cardboard to help resist more dye. 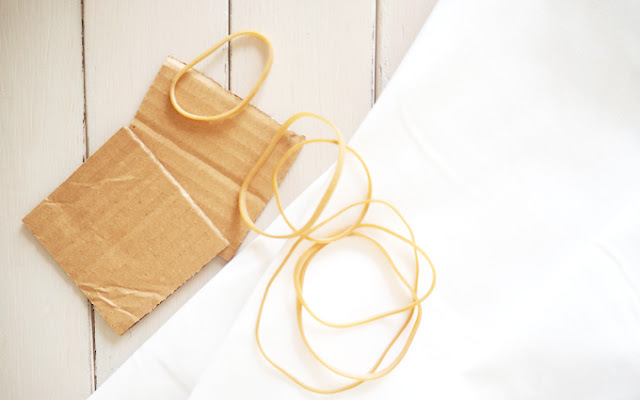 If you want more white lines use more elastic bands. The tighter the fabric is squeezed together the less the dye can penetrate the fabric, so if you want more white bits bind the fabric tighter with the elastic bands. Set up your dye bath according to the instructions on the packet. 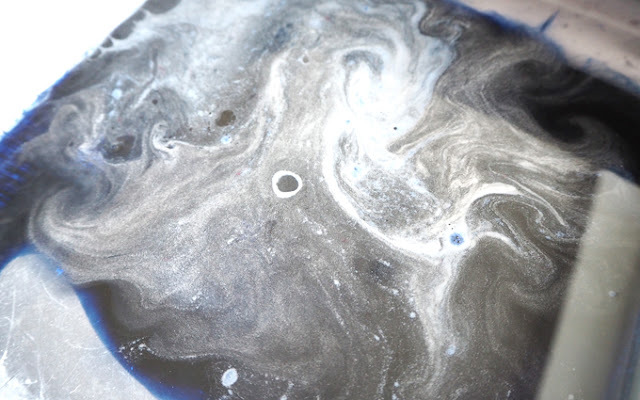 I used about 6 liters of water warm mixed with my powder and some salt. 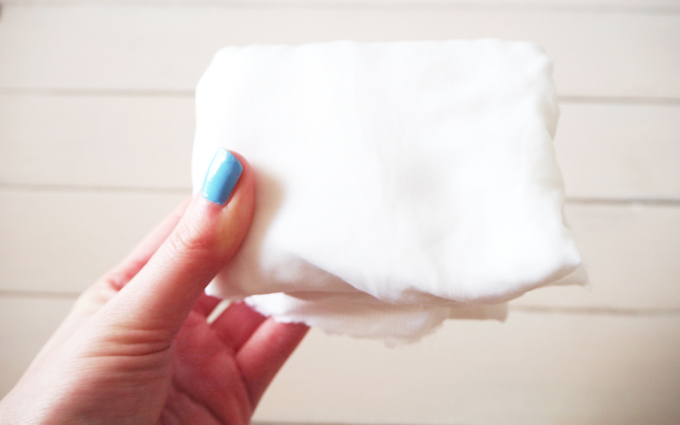 Using rubber gloves place your fabric into the dye bath for around 5 – 10 minutes depending on how deep you want the colour. I think mine was in the for around 5 minutes, during which I gave the water a little stir with a wooden stick. 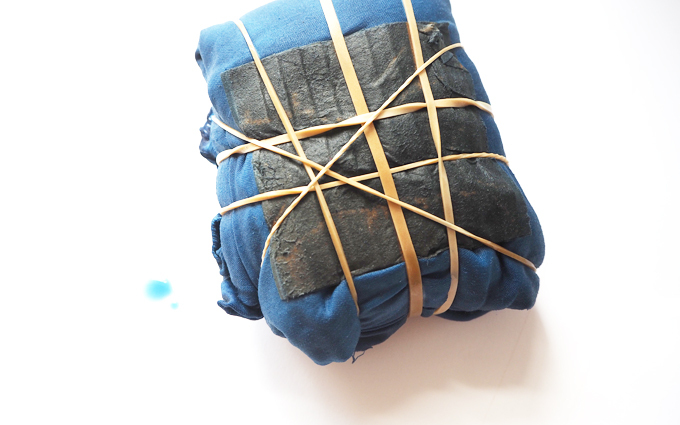 After you are happy it has been dyed enough, take it out of the bath and remove the bands and cardboard. 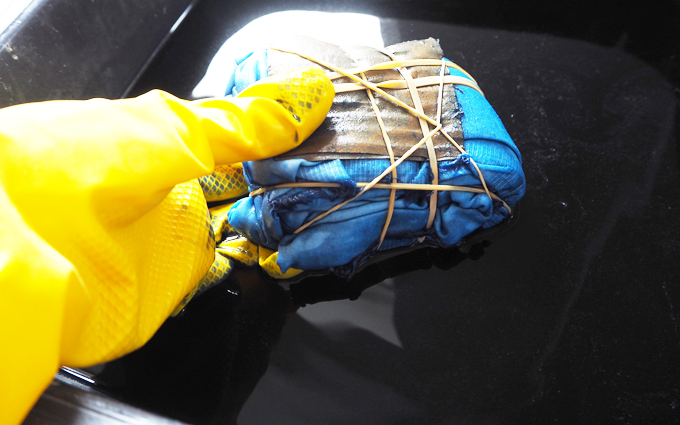 Give it a little rinse under cool water to remove any remaining dyes, then hang it out to dry. I was really pleased with the way mine turned out, although it didn’t look anything like I was expecting I think it looks pretty cool! You can see where the top bit of cardboard was on mine is as this is where the darkest dye is, so bare this in mind when creating your own. 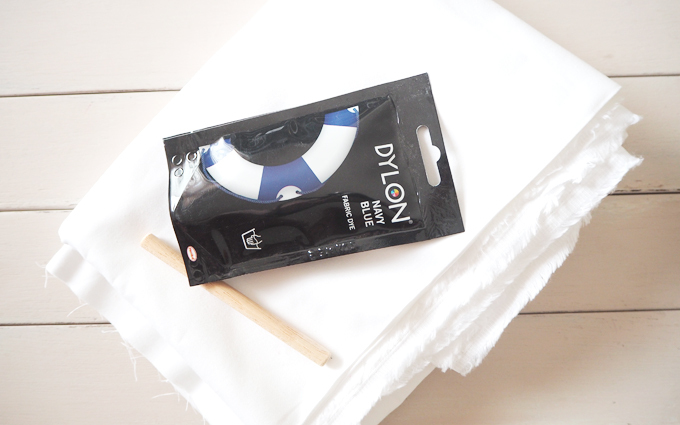 If you want it to soak into the middle a little more, wrap it less tight and leave for longer in the dye. 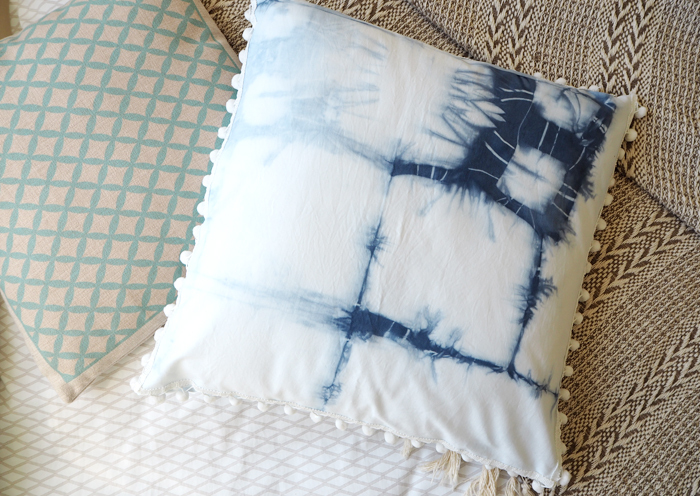 Once mine dried I made a pom pom trimmed cushion out of shibori dyed fabric, keep an eye out later in the week for a tutorial to see how I did it. 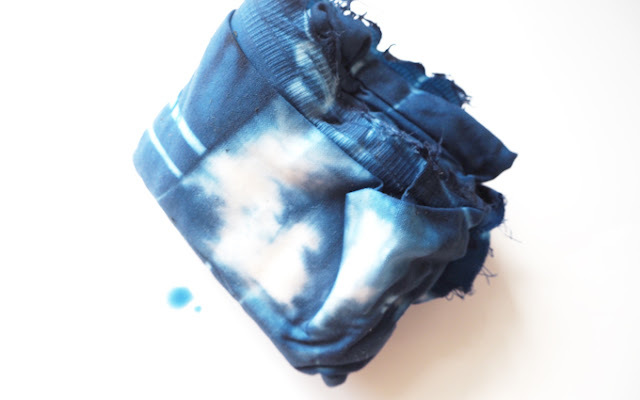 The fun bit about shibori is not knowing quiet what you’ll end up with, it really is different every time you dye. 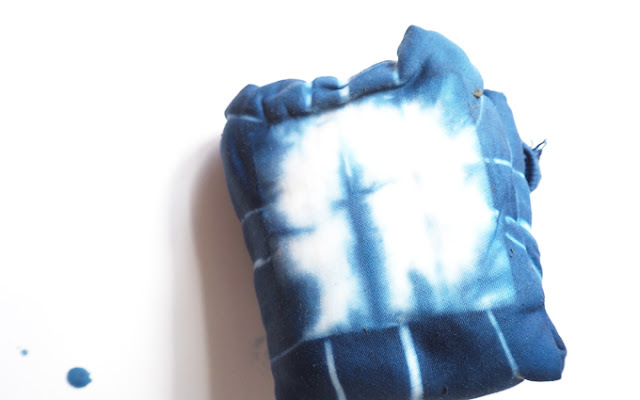 I hope you have enjoyed this tutorial about my first experiment with shibori dying, I loved getting creative and messy with fabric dying and hope to do some more soon. Follow Anna ‘s board | Indigo | on Pinterest.